I tasted beers flavored with peach, strawberry, chocolate, coffee and even banana (!) at this past weekend’s Centennial Beer Festival. A few had citrus tones. Some flavorings were more subtle than others. Many of those beers can only be found in St. Louis at places like Randall’s, Lukas, Friar Tuck’s, the Wine and Cheese Place, Wolfbrau, etc. Two others whose flavors are not so subtle will be available soon in grocery store beer aisles. Following in the path of Bud Light Lime’s successful Lime-A-Rita, Straw-Ber-Rita and Cran-Brrr-Rita, here come Mang-O-Rita and Raz-Ber-Rita. 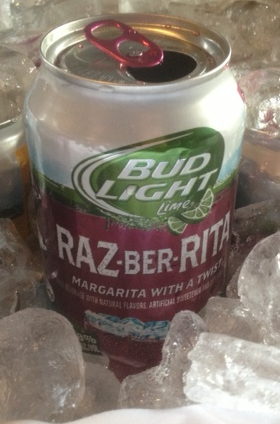 The Raz-Ber-Rita has a tart flavor. 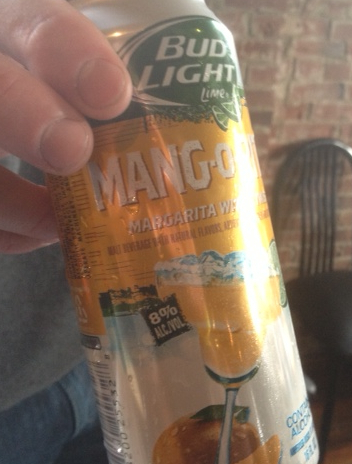 But the Mang-O-Rita is very sweet, almost reminiscent of a wine cooler. At 8% ABV, they have a stronger alcohol content than most beer drinks. The Ritas are hugely popular in the FMB (flavored malt beverage) category, but their flavor profile is quite different from that of mainstream beers. I had my first Lime-A-Rita last season at Busch Stadium. While it has its own virtues and appeal, I wanted beer and Rita did not satisfy that particular thirst. Bud Light Lime’s Mang-O-Rita and Raz-Ber-Rita go on sale in St. Louis on March 3. This entry was posted in St. Louis Food and Drink News and tagged Bud Light Lime, Centennial Beer Festival, Cran-Brrr-Rita, flavored malt beverage, FMB, Friar Tuck's, Lime-A-Rita, Lukas, Mang-O-Rita, Moulin Events, Randall's, Raz-Ber-Rita, St. Louis, Straw-Ber-Rita, the Wine and Cheese Place, Wolfbrau. Bookmark the permalink.